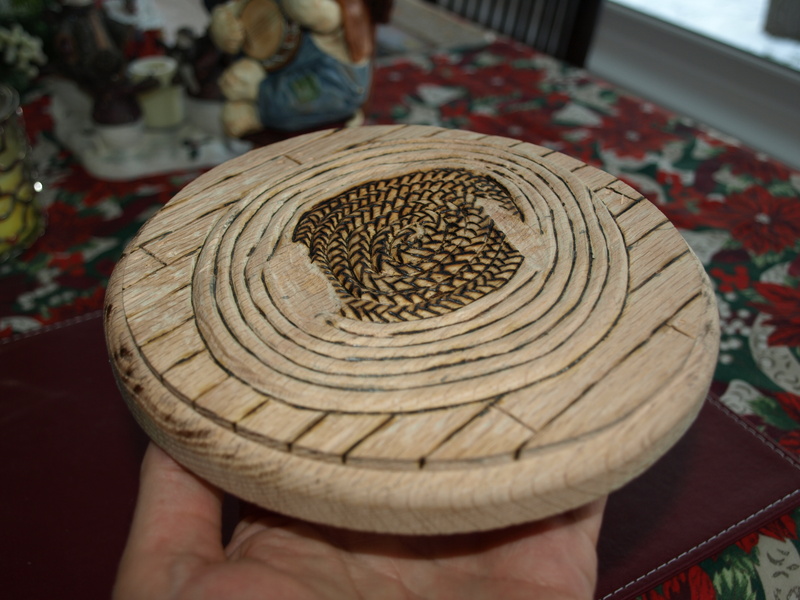 Well, I decided on a circular base as I mentioned in the last post…so, this morning I did the routering and spent a bit of time carving an oval “braided” rug and a few hardwood slats into the top of the base. I’m just in the process of using a wood burning tool to show the braiding in the rug cord. I think that once it’s finished and painted it’s going to look pretty good. 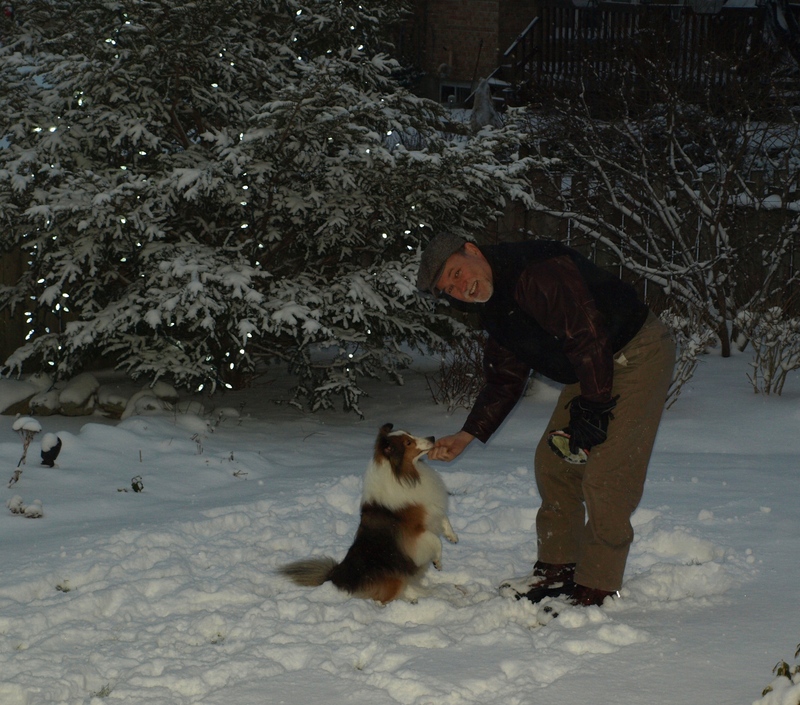 In non-carving news, Rosie and I got a bit of snow-frisbee in today. We also learned a new trick…snow angels…kinda like a normal “roll-over” trick but done in the snow! The little country hound looks amazing Mark and I love the base with the braided rug,fits in perfectly 🙂 and well done to Rosie learning a new trick,the snow looks fun. An awesome base! 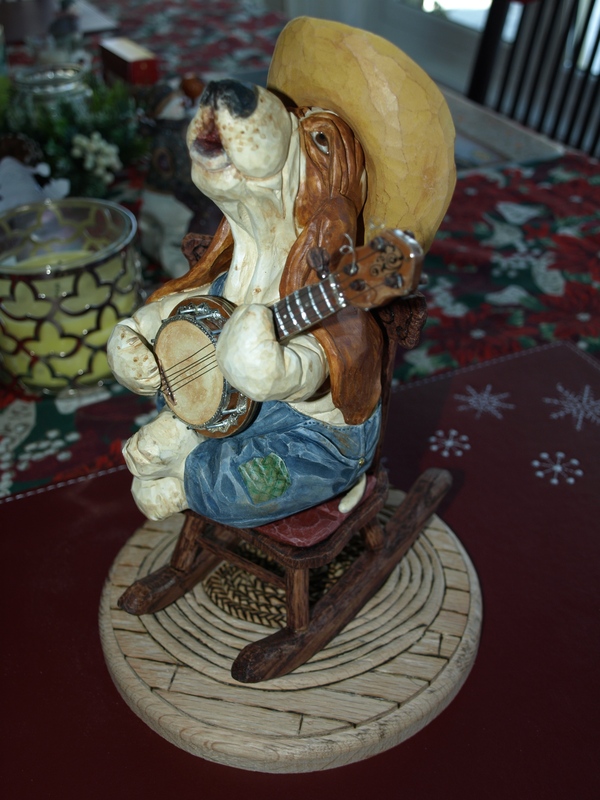 That’s going to look really good with your country hound! I can’t wait to see it finished! Great pic of you and Rosie! Beautiful pup you have there! And a great pic of you and your son toasting in the New Year! Thanks Lynne. The rug is going to be multi-coloured with a bit of wear. My grandma used to make these braided rugs whenever she visited when I was growing up. I remember her being like a machine making these. Mark. Cheryl, that little Rosie is a handful I’ll tell you. A fun little dog. Unfortunately she’s has a lot more energy and smarts than me…so, I think I’m kinda holding her back! Mark.